Once again the Christmas period comes ever closer, and who am I to defy the Yuletide inevitability? As such, I’ve decided to spend some time hunting down some quality Christmas-themed titles to review before Christmas Day, whether it be Horror, Sci-fi or Fantasy. It was rather fortunate, then, that author Jeff Lane recently stumbled across my blog and offered to send me copies of several of his titles for review; although they all looked distinctly interesting, perhaps inevitably my attention was drawn to The Three Scrooges, with its delightfully minimalist piece of cover art. A background as white as snow topped with three Victorian-era top hats bedecked with holly, and some distinctive font choices to make it stand out yet further. Is there a character in literary fiction more associated with Christmas, except Santa himself, than Ebenezer Scrooge? And any characters that are more maligned in the Christmas period than Scrooge? Greed, malice, thriftiness, avarice, mean-spirited: all of these negative qualities, and many others, have been indelibly associated with Ebenezer Scrooge thanks to the libellous writing of Charles Dickens, and which in turn has been propagated through the centuries by a succession of retellings and adaptations of A Christmas Carol. It’s a terrible burden to have on one’s character, but fortunately there are now certain authors brave enough to question the orthodoxy around Scrooge and allow his own story to be told at long last. The first of these brave souls is Jeff Lane, who in The Three Scrooges gives us the truth about Ebenezer Scrooge: far from the ghoulish man portrayed by Dickens, Scrooge was actually a warm, friendly and generous soul, who spent many a year trying to loosen the purse strings (and heart strings) of his friend and confidant Jacob Marley, only managing a partial success before his friend sadly passed into the next life. After establishing Scrooge’s background and occupation, as well as his relationships (excellent with his colleague Bob Cratchit, far less so with his drunken wastrel of a nephew, Fred) through the framework of a sumptuous and generously provisioned Christmas Eve party that Scrooge pays for every year, Lane then mixes things up by introducing certain ghosts and spirits, which visit Scrooge in the middle of the night, as is traditional for this particular story. But unlike Dickens’ tale, these spirits are very different. For a start, there are five of them, and Lane imbues each of them with a disquieting sense of restrained power and a general vaguely sinister feeling; they’re genuinely rather unsettling in the way Lane describes them hovering over Scrooge as his clock strikes one in the morning. Perhaps most unnerving for Scrooge is that two of his ghostly visitors look almost identical to him – one grimmer and bitter in composure, the other dressed in the manner of a soldier, with wounds to match that description. But this is no simple triple-ghost story – here Lane throws a hell of a twist into the proceedings by intimating that the three versions of Scrooge are the result (and possible cause, and victims) of some disruption to the space-time continuum. Only by working together can the three men (or one man, three time, as it were) hunt down the cause of this apocalyptic disruption and bring it to an end – before it ends time and space itself! I enjoyed the way in which the three Scrooges conducted their journey through time and space – having them make use of props provided by each of the Christmas spirits – Past, Present and Future – was an inspired decision, especially as it allows some nice variety in how the time travel actually occurs. As the three men (or one man, three times) travel through time and space, Lane evokes some real emotion in their adventure, as they witness the consequences of whatever has caused a disruption to time itself; their inability to actually interfere in any events they witness, and the resulting frustration, is deftly put across. Each version of Scrooge is shown a particularly grim and depressing fate for themselves and their friends and loved ones if they do not resolve whatever has happened in the past, and Lane does a great job here in making each potential future something that deeply shocks the Scrooges; Lane even manages to make Sour Scrooge personable and even sympathetic at times, particularly when the fate of nephew Fred is a dire one. As the novel progresses the three men travel to the present day, and then eventually the past, in ever-increasing desperation to find the root cause of their timelines being split apart and thereby forcing them to come together. Devastation and desperation eventually force them to travel deeper and deeper into the past, and Lane does an excellent job of looking back at the youth of Ebenezer Scrooge and teasing out the various personality issues and historical events that led to developing into the man depicted by Charles Dickens – and the other two versions depicted in The Three Scrooges. 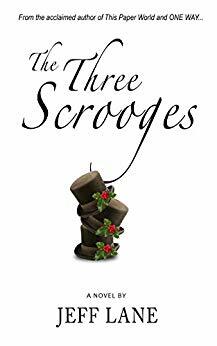 It’s a brilliantly-realised and emotionally-laden journey, and Lane deserves a great deal of credit for creating a three-dimensional and engaging Scrooge that can be envisioned by the reader as having personality aspects derived from all three separate Scrooges. A wry sense of humour occasionally emerges as the story progresses, such as an amusing aside as to the mysterious origins of that infamous phrase, “Bah, humbug!” Lane demonstrates a good use of language, evoking the Victorian-era language and phrasing of Dickens while not descending into outright pastiche. He really has fun with the format, and it’s often difficult to read more than a few lines without hearing the tongue-in-cheek tone in the authorial voice; it certainly makes it all the more enjoyable to read. The same can certainly be said for the characters to be found in The Three Scrooges, particularly the three titular protagonists; Lane has obviously had a huge amount of fun writing the three men, particularly the ‘original’ grumpy and mean-spirited Scrooge as portrayed by Dickens, and that fun infuses the rest of the book, as the three bicker and fight their way to a resolution of sorts. Even the omnipresent narrator causes more than a few chuckles, with their wry observations and slowly-increasing confusion over whether events have actually taken place and where in the timeline the Scrooges actually are. The Three Scrooges is no less than an epic reworking of Dickens’ A Christmas Carol, and a fascinating idea – to use time-travel as a device for delving deeper into the character, personality and history of one of fiction’s most famous characters, Ebenezer Scrooge. Brilliantly written, fervently imagined and with a deft eye for characterization and a sense of emotional drama, Lane has written a touching, thought-provoking and unique piece of science-fiction that successfully re-imagines the life story of one of the most maligned and disliked characters in the history of fiction.